If you’re cutting back on sugar, it might be worth trying Sweet Freedom, a fruit syrup that has a low GI, per cent fewer calories than sugar, and is less sweet-tasting than honey, available from most supermarkets. If you like slicing rather than crushing garlic, but fear for you fingertips, then thee hand-held Zyliss gadget might before you. With a non-slip base for stability, a storage container so you can prep in advance, and a cap to protect fingers, it guarantees perfectly thin and even slices of garlic. £11.99. The problem with pouring bleach down plugholes is that it can simply run straight into the drain without touching the sides. The solution? Thuraplug, which holds the bleach in place using a rubber bulb. You’ll never have to worry about an accidental red sock sneaking in with your white laundry, if you put a Dr Beckmann colour and Dirt Collector Sheet into the washing machine drum with your clothes. Add detergent as normal, and any loose colour and dirt will be collected and locked in the sheet. £2.99 for 30 sheets, from most supermarkets. Add a das of vinegar to the water to stop any mould from growing (it’s the mould that causes flower water to smell). To keep your cut herbs fresh, wrap them in kitchen towel in the salad drawer. If you’re scrapping bits off your chopping board with a knife before cleaning, use the other side, not the blade side, so you don’t blunt your knife. Here are her tips for getting ahead in the garden. 8. Get out the secateurs and give your lavender a little “trimette.” Of course, you did your main prune in August/September, but an extra small chop of any stragglers helps keep a good, bushy shape. 9. By the end of March, you should be able to plant out perennials. Always plant in clumps of odd numbers, for maximum impact. 10. Feed your fruit trees and bushes with a multipurpose feed, such as Growmore. This will give you a better crop later in the year. 11. If the weather is warming up sufficiently, you can order vegetable plug plant now. If you only have room for pots and containers, start with climbing beans. Dig out all that odd and slighty chipped china from the cupboard. Then have fun smashing it up to use as drainage for your summer pots. If you want an easy, portable way to carry a few pills – medication, painkillers or vitamins – an old contact lens case is the perfect size for crying in your handbag. Now’s the time to start collecting jars for all that delicious summer preserving – soak to remove labels, wash in very hot, soapy water, but always store without lids to keep fresh. Or stock up on some classic Le Parfait jars, 15.99 for a pack of six half-litre jars. This app lists 60 herbs and species in an easy-to-follow format, and explains how to cultivate, grow and cook with them, plus medical uses. This Hugh Fearnley-Whittingstall app aims to encourage growing your own by connecting people who have spare land with those who want to use it. An alphabetical lists helps you identify more than 60 of the most common weeds – and how to manage them (plus any possible uses they might have). As well as being a glossary and comprehensive gardening encyclopedia, this app reminds you when to tend or harvest, plus has a to-do list for jotting down easily neglected garden tasks. Keeping a reusable bag in your handbag for impromptu shopping trips really cuts down on the plastic in your life. Envirosax is a range of reusable bags that fold up small, weigh nothing, are super sturdy – and look nice! £66.50. If you can’t be bothered to polish tarnished silver cutlery, boil it for ten minutes in a saucepan of water, lined with aluminium foil. When you’re baking something blind, use foil rather than baking parchment, as it fits snugly into the corners doesn’t curl up and gives a neater finish. Put sugar cubes in your biscuit tin to keep them fresher. the cubes will absorb any moisture, which makes your biscuit last longer. These easy will infuse your home with the Easter spirit. + Beautiful Bottles. Transform old glass bottles into gorgeous vases by pouring a water-based paint in through a funnel, a little bit at a time, adding water if needed. Replace the lid, swirl the paint around untill all surfaces are covered and pour out any excess. Allow to dry. + Decorative Nest. Display eggs in a nest – try it yourself or ask your local florist – nit makes a great gift. Shape wigs around a mixing bowl to a make the base, using thin wire or dark thread to secure. Can’t get the marmalade lid to budge? Place sandpaper over the top and twist. You’ll be out of a jam in a jiffy. Fold a piece of medium-grit sandpaper in half, rough-side out, and use the creased edge to scrub out the stains in the bathroom tile grout. Spruce up a suede bag by lightly buffing dried water spots with fine-grain sandpaper. Wipe fine-grain sandpaper over a sweater in one direction – gently! – to lift pesky pills. Slippery soles can cause slapstick falls, if you’re not careful. Guard against this by rubbing medium-grain sandpaper over thee bottoms of new shoes to give some traction. Start at the top of the house and work down. As you finish each room, shut the door to keep the dust out. Clean downstairs in the same way, ending with the hallway. 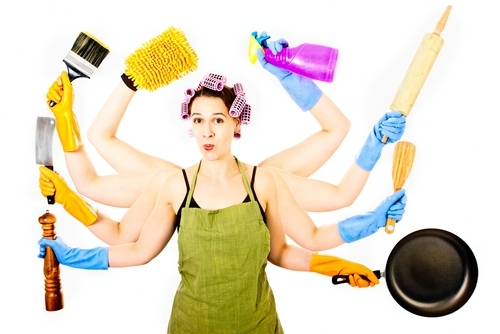 By working methodically, you’ll know the whole house is clean. This is how chambermaids were taught to clean at The Savoy. First, stand at the door to see what needs doing – whether dusting, mopping or vacuuming, the rules are left to right, top to bottom and back to front. Thinking about washing that grimy wall? Don’t bother. It’s much quicker and easier just to repaint. And as for washing ceilings… are you mad? Remember, spring cleaning doesn’t have to be done all in one go or even in spring. Make sure you clean the windows. Use warm water with a drop of vinegar and a drop of vinegar and a drop of washing-up liquid. Wash thee windows, then use a rubber-bladed squeegee to remove the water. Wipe any small streaks with a dry cloth.